Herbal Care Oils - What's so special about them? High quality organic Body & Massage Oils. Frantsila herbal oils are easily absorbable, all natural, and mildly fragrant. A wide range of Body oils, Treatment oils and Massage oils have been developed for specific needs, and are intended for both professional use and treatments at home. Whilst all Frantsila herbal oils are perfect for massage, some are great body oils for daily use instead of body cream e.g. Frantsila Herbal Oil. A light massage is always beneficial and even recommended when applying the Auyrvedic treatment oils daily: Vata, Pitta and Kapha. The famous St. John's Wort Oil and the Ayurvedic Pain Relief Oil are both excellent for the treatment of painful areas, and there are many more herbal oils for you to discover. What is so special about Frantsila herbal oils? Finnish organic herbs and the gentle production methods guarantee the efficiency and purity of Frantsila herbal oils. In manufacturing gentle methods are used to store the herbal medicinal effect and bio-energy. 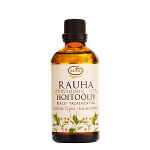 These herbal oils emit Finnish summer meadows and forest plants, clean scents, active ingredients, green colors and life forces. 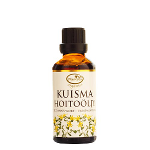 Finnish Flower Remedies are added to balance and harmonize body and mind, and genuine Essential oils to enhance the therapeutic effects. "The base oils" in Frantsila herbal oils are precious oils that are cold-pressed from organically grown plants: sunflower, olive, almond, apricot seed, avocado, jojoba, sesame and wheat germ oil. The choice of base oil is determined by the part of the body the product is designed for and the desired effect. The base oils used are already inherently rich in micronutrients, vitamins, chloroplasts, carotenoids and enzymes. The herbal extracts still considerably increase the nourishing and healing properties. Thanks to the gentle extraction method it is precisely the oil-soluble ingredients that are absorbed from the plants, and these penetrate skin most easily. Cold-pressed vegetable oils do not clog pores or disturb the skin's natural enzyme activity. They do remove the skin's natural vitamins such as mineral oils are known to do. Vegetal oils stimulate blood circulation, while the mineral oils (Paraffin = Paraffin, Petroleum = Vaseline) are said to clog blood vessels. Mineral oils are fuel oil by-products and non-renewable resources (Vaseline, paraffin). Frantsila does not use artificial and harmful preservatives, emulsifiers or perfumes in herbal oils! The active ingredients that are extracted from plants work as preservatives, as well as wheat germ oil and natural E vitamin. Frantsila herbal oils do not generally cause any allergic reactions for sensitive skin, only if the person is allergic to a specific herb present in the oil. When applying on very allergic skin, first try on a small area (such as inner side of wrist), wait for a few minutes and apply fully only if no reaction. 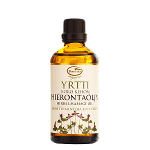 Frantsila herbal oils meet European standards for natural cosmetics. No animal testing, animal or genetically modified substances, mineral oil, silicates, artificial colors or scents, or parabens. The ingredients marked with * are certified Organic.